Shape-a-Saurus Activity Case and Treasure Keeper enjoys his popularity and has located a distant cousin…UNA-corn. UNA now shares the limelight with the same zippered pockets for electronic devices, crayons, pencils and snacks and the two extra pockets for a tablet or two. Each is perfect for corralling the small things to keep a child occupied and quiet, when quiet is needed. Add on sales include poly covered foam, interfacing and fusible web. Eazy Peazy Gal recommends Bosal Foam and Fiber In-R-Form #492, Dura-Fuse #434 and Splendid Web Plus #445. The pattern also calls for an applique sheet, Sulky kk2000 Temporary Spray Adhesive, zippers and Wonder Clips. Stop by the booths of Checker Distributors and Bosal Foam and Fiber where Shape-a-Saurus and UNA-corn will be “hanging out” just waiting to meet you. 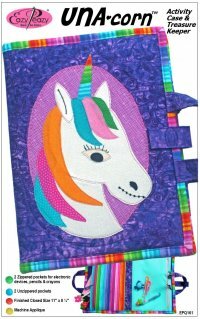 Remember, as always, Eazy Peazy patterns are exclusive to fine quilt shops and ordered through distributors. Wholesale orders ship postage free in the U.S. within 24 hours of payment of Pay Pal invoice.